Experts say gold could have done much worse in 2018 given the obstacles it faced. Here we recap the major gold trends of the year. The gold price has dropped almost 5 percent since January, despite a year where the markets were driven by geopolitical tension. Towards the end of September, the yellow metal fell to its lowest level when it traded at US$1,182.40 per ounce, although prices have climbed back up since then. 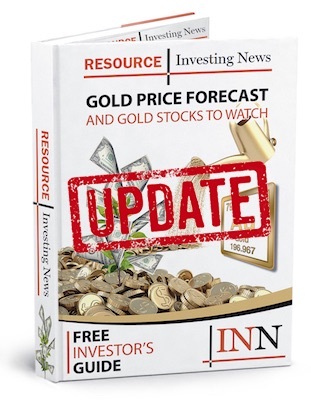 As the year comes to a close, the Investing News Network (INN) is looking back at the main gold trends of 2018, from the impact of US Federal Reserve interest rate hikes to widespread geopolitical uncertainty and the rise of the US dollar. Read on to learn what happened in the gold market in 2018, from the ongoing issues that weighed on the precious metal to how analysts thought the market performed in every quarter throughout the year. The gold price gained more than 3 percent in Q1 2018 despite a volatile February, when the yellow metal experienced its first monthly loss of the year. A weaker US dollar and inflation supported gold over the period. While gains were initially offset by expectations that the Fed would raise rates, gold trended upward after the hike became official. Geopolitical concerns were also top of mind during the first quarter of this year. As mentioned, another factor that drove the gold price during the first quarter was anticipation surrounding interest rates. “There’s a battle going on right now. Interest rates going up in the US and the dollar strengthening, but the government down there wants it lower,” said Rob McEwen, chairman and chief owner at McEwen Mining (TSX:MUX,NYSE:MUX). During Q1, many market watchers predicted that gold would not only have a bullish Q2, but would also experience a bull market for the majority of 2018. Speaking about the catalysts that could move the price of gold in 2018, Goldman Sachs (NYSE:GS) noted that “the dislocation between [gold] and US rates is here to stay.” The investment bank expected the yellow metal to “outperform” in the months following the end of Q1. During the first quarter, gold traded between US$1,302.50 and US$1,357.70. The price of gold fell more than 6 percent in the second quarter, dipping below the crucial US$1,300 mark in mid-May, where it stayed for the remainder of the quarter. A strong US dollar, benchmark US Treasury yields topping a seven-year high and a second Fed hike rattled gold over the quarter. While gains were made on the back of geopolitical concerns at the beginning of the period, investors shied away from holding bullion as a safe haven during market uncertainty throughout the second half of the quarter, causing the precious metal to reach lower highs and even lower lows. “A strong dollar makes gold more expensive to buy for holders of other currencies, which weighs on demand, while rising interest rates erode the metal’s attractiveness as an investment compared to yield-bearing assets,” Angela Bouzanis, senior economist at FocusEconomics, told INN at the time. “During this time, gold dropped from US$1,346 to US$1,279 for a loss of 5 percent. These numbers further illustrate the ongoing negative dollar-gold relationship,” he added. “The dollar strengthened due to the US Fed increasing interest rates, and Fed talking heads issuing guidance to expect more rate increases at regular intervals. Plus, global markets appear to perceive strong economic growth in the US, leading to a bid up for dollars,” he added. During the second quarter, all analysts were in agreement that gold would not be entering a much better atmosphere in Q3. The yellow metal traded between US$1,247.10 and US$1,352.80 during Q2. The price of gold fell almost 5 percent in the third quarter, dipping below US$1,200 in mid-August, where it would stay for the majority of Q3. A strong US dollar was the main catalyst behind the yellow metal’s continual downfall throughout the quarter, as investors chose the greenback as a safe-haven against geopolitical concerns over bullion. Additionally, another Fed hike took place on September 26. On top of a flourishing greenback, the US also experienced a thriving economy during the third quarter, which had a negative effect on gold. “Robust economic growth in the US is driving the Federal Reserve to tighten its monetary policy,” Ricard Torné, lead economist at FocusEconomics, said at the time. “As a result, US yields are rising, shifting capital flows from safe-haven assets such as gold and to a lesser extent silver to US dollar-backed assets,” he also noted. Finally, a third Fed interest hike once again affected gold prices towards the end of Q3. Gold declined prior to the hike being announced, was flat directly after it became official and then landed at a new six-week low, experiencing its longest monthly losing streak since January 1997. “The outlook for gold prices in the current term remains dim as such in lieu of rising rates and yields amidst buoyant US economic conditions,” said Benjamin Lu, commodities analyst at Phillip Futures. Gold traded between US$1,174.70 and US$1,257.30 in Q3. The gold price made some moves upward in the last quarter of the year, but was still down 5 percent on a year-to-date basis at the start of December. Economic prosperity in the US and an expected interest rate hike in December have been some of the key factors driving prices during the period. “[T]he Fed remains on track for a widely-expected rate hike in December, as per its Open Market Committee statement released on 8 November, which would support a dollar that has already found some uplift in recent weeks,” stated analysts at FocusEconomics. “Broadly speaking, higher Fed rates tend to weigh on gold, as it provides no yield, while a stronger dollar makes the precious metal more expensive for users of other currencies,” they added. December, particularly after the final Fed hike of the year, should give some insight into what to expect from the yellow metal in the new year. The yellow metal has been trading between US$1,182.40 and $1,239.10 during the quarter. For gold market predictions, stay tuned for our gold analyst and company outlooks. You can also read the list of our most popular gold news stories of 2018 by clicking here.